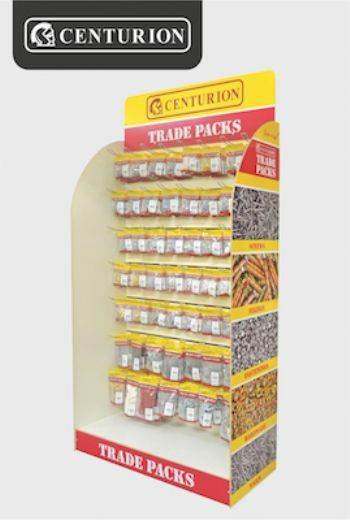 Centurion is helping retailers maximise sales of its newly launched Trade Packs with a bold, yet practical merchandiser. Equipped with integral labelling which allows the price and barcode for corresponding products to be clearly displayed, the merchandisers maximise available space ensuring that the product can be viewed to its best advantage. Trade Packs offer an extensive range of over 300 of the most commonly used hardware lines, including nuts, bolts, fixings and nails, presented in handy re-sealable bags coming in three sizes.